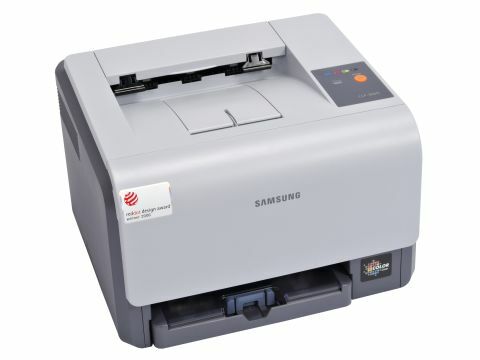 The Samsung CLP-300N is only slightly larger than many an inkjet printer. Yet it still comes with a full compliment of features. Not only does it offer an effective 2400 x 600dpi, just like the big boys in its class, but it also sports a healthy 32MB of memory and a rapid turn of speed. Indeed, the 16ppm mono speed puts a lot of other printers in the shade, although colour printing is a slightly sluggish 4ppm. There is some downsizing evident, such as the way the paper input tray only takes 150 sheets of A4 rather than the more usual 250 pages, and it protrudes from the front of the printer. There's also no manual input tray for specialist media and envelopes. You can swap regular paper for envelopes in the main input tray, but this is a bit of a chore. Even the cartridges are smaller than average, with a circular cross section that resembles yoghurt pots. You can still get about 2,000 pages out of the slightly larger black toner cartridge, but the cyan, magenta and yellow cartridges only last for 1,000 pages each (at five per cent coverage). As you might expect, small toner cartridges result in higher print costs; while the Samsung is competitive for mono printing at 1.8p per page, it's a bit on the high side for colour at 8.9p. Even so, this is much less than we expected and a lot cheaper than using low-yield cartridges. Another plus side is that a full set of four cartridges will only set you back a relatively meagre £124. That's only a third of the price of high-yield cartridges for some of its rival printers. Another surprise, considering that every cubic millimetre of the CLP-300N must be full to bursting, is that Samsung has managed to squeeze in Ethernet networking as well as USB. The printer driver is also friendlier and more informative than most, making it relatively straightforward to use when manual duplex printing or changing print quality settings. As for print quality itself, mono pages were lusciously rich in our tests although font edges were a little less defined than with other printers, giving them a slightly rounded appearance. There was also a hint of ghosting around font edges when printing mono text on blocks of colour used as a background. First page times for mono and colour document printing were an impressive 13 seconds and slightly disappointing 28 seconds, respectively, and the Samsung proved to be a bit of a slouch for photos, requiring 47 seconds or more for a full page output. For photographic quality, prints weren't as rich as we had hoped, with colours looking a little pale and washed out in general. On the plus side, fine detail was recreated very well and banding or streaking in pale blue skies was minimal. If space is of the essence, the Samsung CLP-300N is definitely well worth a look.